Please allow 3-4 days processing on all orders. If we happen to be out of stock for any item(s) ordered, we will contact you to let you know what the turnaround time would be and get your approval. In the unlikely event that orders are lost or damaged during shipping, USPS is solely responsible. If there are any problems please notify us and we'll do whatever possible to have your money refunded and/or ship a new order ASAP. We do not ship on Saturdays or Sundays with the exception of Holidays. 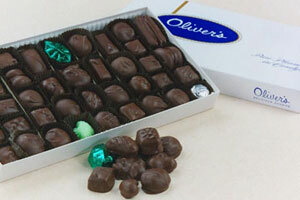 Oliver's Candies stands behind all of our products. If there are ever any problems or concerns with the quality of our candy, please contact us directly at (585) 343-5888 or info@oliverscandies.com. 100% satisfaction guaranteed! If the destination of your purchase is 70 degrees or above, we recommend that you add an ice gel pack to your order through the option of Warm Weather Shipping. We urge you to check your region's weather forecast, if possible, and place your order during the coolest days. We will only guarantee our products during summer months if you choose to ship your order via Priority Mail Express. We cannot guarantee from heat damage if the candy travels by any other means.